I’m missing some seaside Saya photos from inbetween but I’ll post them eventually. I should go to my local beach with her soon, so maybe I’ll post those with the new ones -if I manage a shoot. 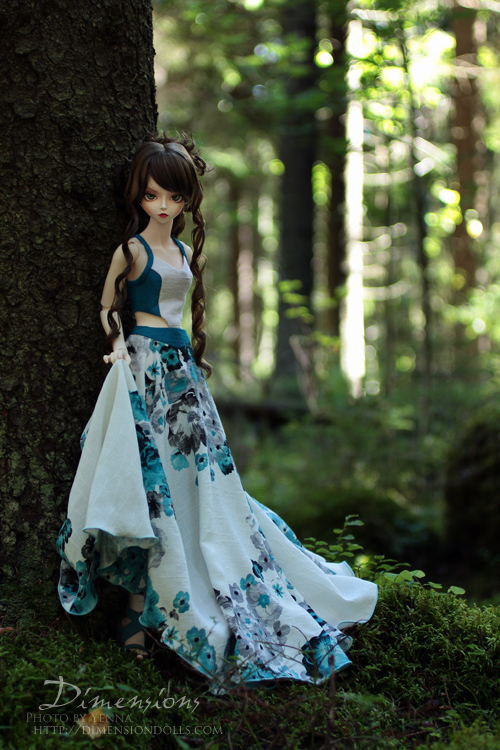 Today I’ll be posting some Sebille in a forest wearing a dress that’s way too fancy for the location. Haha. I needed a really Finnish scenery for this dress because it really reminds me of Finland (esp. our flag), and I’d had this place in mind for a while. I just needed a really sunny day for this. Usually I like to shoot when it’s cloudy, but this forest really looks best when it’s sunny, because the trees don’t let in a whole lot of light. This dress will be in my Etsy very soon, along with a small update of tops and shirts. I actually have a lot of different alternate reality stories for these two characters because I love them, but this is closest to the storyline I have in photo story form. Only most of it happens at Null’s mansion which has never been seen in photo stories because, well, props. =__=;; Also the initial setting is different and there are tweaks to their past, but the characters are pretty much all the same. Anyway, due to the writing I felt the need to photograph these two together. They’re less of a pain to pose now that at least Sebille is more stable, but Null still gives me heart-attacks. x_o I also had Seb’s eyes positioned a little weirdly so she’s a bit blank looking but oh well. She’s the hardest to position eyes for out of all my dolls because they’re so big. I do think she’d benefit from eyes that have an iris that’s 1mm bigger but really, I’m not risking it anymore. Over the years, I’ve bought her a ton of eyes and I think I’ve finally found the right colour, size and quality combo, so better not mess with that. She would need a new face up, though, because her face is kind of grey-ish, thanks to the old MSC layers, but I’m just kind of scared of re-doing it, because it’s perfect the way it is right now. And I’m definitely not feeling face ups currently. I have a several of my own dolls I would need to paint, but before I can even think about them, I need to finish a pile of commissions (so sorry I’m being slow!!). I think I will also like to sand her neck a bit to make it thinner -just to match her old looks a bit more. Otherwise the body is quite good. I’m waiting for it to yellow a little to match even better. 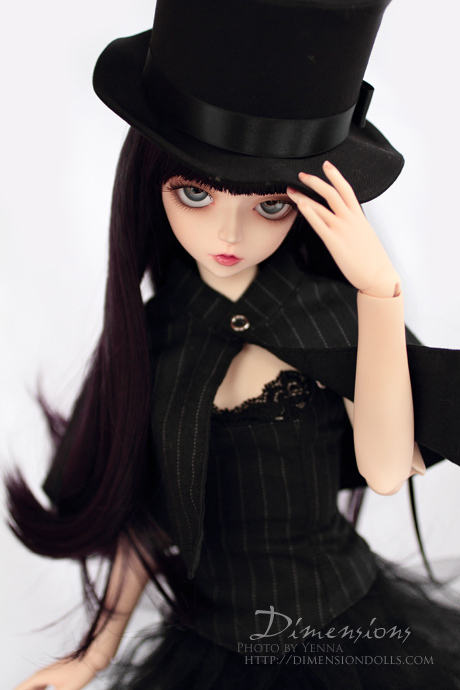 :D I put her old body for sale in the selling pages for cheaps. I’ve been working on sewing and face up commissions lately. The latter being a bit of a pain because of the weather, but I’m getting there… So, not much photos. But I did take these the other day. It was supposed to be my continuation to the previous Seb/Null photos, but unfortunately the heavy snowfall stopped right after the first photos of Null and I totally lost my inspiration. Sebille is also a noodle and I don’t feel like tightening her because I just want a new body for her. Anyway, a few photos (so not happy with them). I wanted a really good snowstorm going on but nope, just my luck..
Alright, first snow! And finally the rest of my earlier Sadol package makes an appearance: the umbrella! The moment I saw it I was like holy hell I need to have it! I’ve been dreaming of a black SD size umbrella for years. 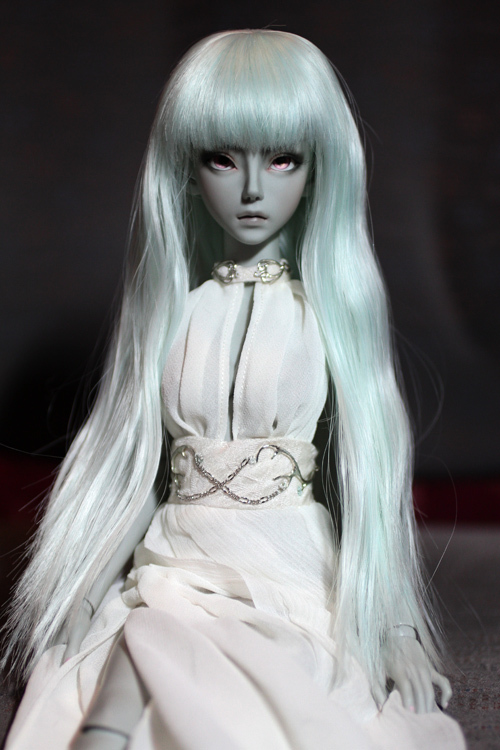 I even wrote about it on the Finnish doll forun back in 2008… I had to wait a long time and it’s too big for my SD girls (originally wanted it for Sebille) but Null has more stable arms for holding it anyway. I was going to do a review of the umbrella, because it’s gorgeous and comes with it’s own bag and everything, but it’s so damn dark indoors that I can’t get any good photos taken. 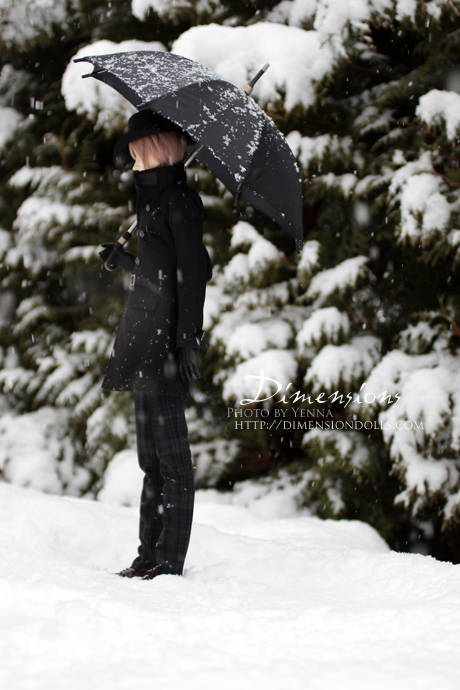 =__= It’s really quite huge, more like a golf umbrella for a 70cm doll, but works well for two dolls. It’s also surprisingly light. Not sure how it compares to the cheaper ones available but I’m sure that Sadol has made all the plastic parts themselves by casting them in black resin (it resembles Withdoll’s optional parts). The handle doesn’t stain the doll hands and all the shapes are very sleek. I love it ♥ Null has no problem holding it up without support, as you can see. I’ve been waiting for snowfall to take these photos, and while I was doing this, I got an idea for another shoot that I’ve planned down to the last detail already. I just need to wait for a colder weather and a more powdery snowfall -whenever that will be. x_x Still, it’ll be so much fun and I hope I’ll be happy with the results. This was more of a test run. Just a random idea I had. Nothing special, but at least it gave me a few hours of some productivity. It took me a while to build the set, although it was kind of crappy, but it was mostly wasted anyway because it’s not visible in the photos. I took some more of less random Sebille x Null photos today. I actually managed to go outside, but the weather wasn’t as nice as I’d hoped. I’ll re-do this eventually, probably because I’m not really happy with the photos. But it was so nice to be outside for a change that I just kept on going although I knew the photos weren’t coming out that well. I had a very dolliful weekend for a change, actually. Next weekend I need to be working on doll related things for our local museum (I’m taking a few of my dolls there for a few months to be a part of an exhibition), so I might not have time to take photos for myself. This is so very out of character, because Sebille would NEVER be this close to Demyan willingly. He’s more of a random prop here, because otherwise this is in character for Sebille. At least in the past was because she was a model. I got her this Leeke wig because I had nobody else to get a blackberry colour for (not that you can see the colour well in these photos) and it kind of channeled her young self, so I had to style her accordingly. Posted in Angelregion, Big dolls, DollsheTagged null, sebille comment on Come inside, will you?